Queens lawmakers sought Sunday to head off a bill expected in Albany next session to add a toll on the now-free East River bridges while slashing prices to cross bridges linking only the outer boroughs. Assemb. 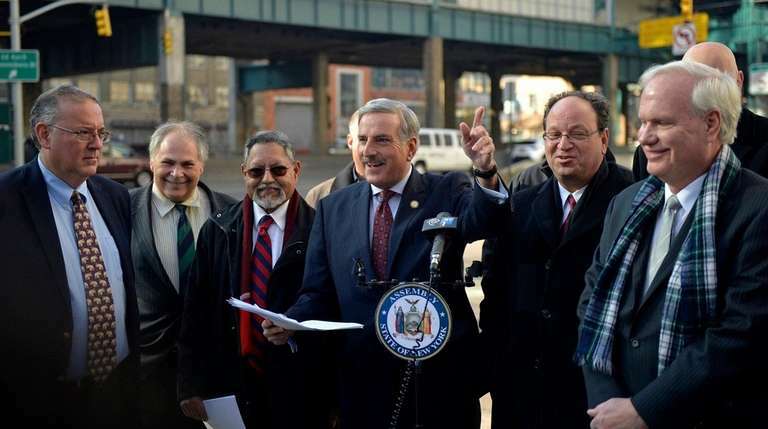 David Weprin criticized the Move NY plan as a “renewed congestion pricing initiative.” The plan — pitched by former city traffic commissioner Sam Schwartz, transport workers unions and environmental justice groups as a means of more fairly spreading expenses — is intended to reduce traffic congestion and raise funds for the MTA. Opponents gathered at the foot of the Ed Koch Queensboro Bridge in Long Island City said Move NY burdens middle-class residents in the outer boroughs as well as small businesses. He and Weprin (D-Hollis Hills) were joined by Queens business and community leaders, including one man who admitted that en route to the news conference, he accidentally drove into Manhattan across the bridge and had to circle back. The round trip would cost as much as $16 in tolls under Move NY. “It’s been put in the oven, it’s been mushed around, it’s been baked over again, but it’s still a tax on the residents,” said newly elected City Councilman Barry Grodenchik (D-Queens). Weprin added after the event that the plan also would hurt those in Nassau and Suffolk counties who commute into Manhattan. “Tolls are user fees, not taxes, and the proposed toll swap seeks to create a fairer and more balanced system for distributing those user fees, so that everyone benefiting from the city’s infrastructure contributes toward its repair and maintenance,” Move NY campaign director Alex Matthiessen said in response. Matthiessen said the plan is different from former Mayor Michael Bloomberg’s congestion-pricing initiative and would help bring in money “toward aggressively filling transit gaps” in parts of the outer boroughs and the suburbs. There are other means of raising revenue for the Metropolitan Transit Authority, opponents said. Avella said he seeks to legalize online gambling. Weprin sponsored a bill to levy a 1 percent commuter tax on those who work in the city but live outside it. City voters oppose the Move NY plan by a very narrow margin, according to a Quinnipiac University poll in August that showed 49 percent of people in opposition and 44 in support. Matthiessen confirmed the Move NY coalition plans to help introduce a bill in the state legislative session that begins next month.